THE ARCHBISHOP OF Lyon has been given a six-month suspended sentence after being convicted of helping to cover up child abuse over a two-year period. Cardinal Philippe Barbarin was found guilty of failing to report the abuse of a child between 2014 and 2015. It follows long-standing allegations from victims’ groups that he failed to report a priest under his authority to police after learning of abuse that took place in the 1980s and 90s. However, prosecutors judged that those crimes were beyond the statute of limitations – meaning they were too old to prosecute – and declined to press charges. 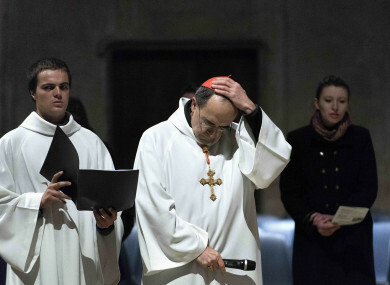 Barbarin becomes the most senior French Catholic cleric caught up in the paedophilia scandals that have rocked the church in recent years. The 68 year-old’s legal representatives said that he would appeal the judgement. During the trial, victims accused Barbarin of being aware of the abuse allegations from at least 2010, and then trying to cover up the scandal under orders from the Vatican from 2015. Francois Devaux, who leads a victims’ group in Lyon, called today’s verdict a “major victory for child protection”. Email “French cardinal given six-month suspended sentence for helping to cover up child abuse by priest”. Feedback on “French cardinal given six-month suspended sentence for helping to cover up child abuse by priest”.